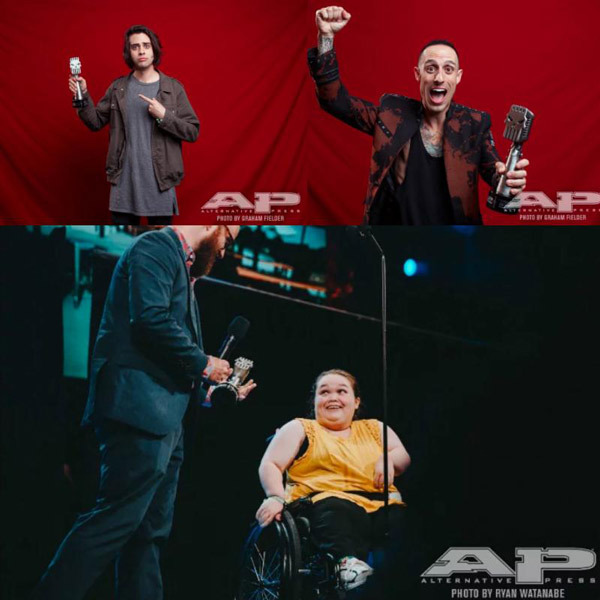 The Alternative Press Music Awards had its annual ceremony July 17 in Cleveland, Ohio at The KeyBank State Theatre. Hopeless Records artists came in full force with members of Sum 41, Neck Deep, The Wonder Years, With Confidence, Sylar, Trophy Eyes and Hands Like Houses in attendance. The label saw many nominations, with Moose Blood nominated for Album of the Year and Best Breakthrough Artist and With Confidence nominated for Best Underground Band and Best New Artist Video who took home the award. Sum 41 was nominated for Artist of the Year and Music Video of the Year for their song "Fake My Own Death" and their very own Frank Zummo was nominated for Best Drummer and took home the award. In addition to Frank taking home his first Skully, his night included a very special drum performance with friends Adrian Young (DREAMCAR / No Doubt) and Josh Dun (Twenty One Pilots) that brought the house down. To watch a video of this epic #DrumExplosion, head here. The label's charity arm, Sub City, also presented Cassie Wilson of Half Access with a check for $10,000 as the winner of the Sub City #APMAS Grant. Cassie was chosen out of many applicants for her goal to give disabled music fans a voice in accessibility issues at concert venues throughout the US. For more information on Half Access, please visit: https://halfaccess.org/. On stage to present the award was Dan "Soupy" Campbell, frontman of The Wonder Years and this year's Sub City grant ambassador. "We are thrilled to be teaming up with Soupy from the Wonder Years and Alternative Press to award this first grant," Louis Posen, president of Hopeless Records/Sub City, said. "This is our way to say, 'Here is money so you can take your great idea and take action to make the world a better place.' We recognize there are a lot of smart fans and bands with amazing ideas that are only missing funding to get off the ground or to get to the next level." Hopeless Records is one of the largest independent labels in the world and a leader in alternative rock artist development. Recently, Hopeless has developed the careers of young bands like Neck Deep, With Confidence, Trophy Eyes, Sylar, Moose Blood and many others. The label has released albums from established acts like Yellowcard, The Used, and All Time Low. Meanwhile, Hopeless continues to attract iconic established artists like Taking Back Sunday, Sum 41 and Bayside. The label's 501(c)(3) charity arm Sub City was established in 1999. It has raised over 2 million dollars for over 50 non-profit organizations by connecting bands and fans to causes they are passionate about. Sub City has been recognized for its efforts by the 110th U.S. Congress, the California Senate, the Los Angeles City Council, the National Association of Retail Merchandisers (NARM), Billboard Magazine, Alternative Press Magazine, The Los Angeles Timesand many other publications.